To say Helen is unhappy would be an understatement. She works 15-hour days at a high-stress financial job, where she struggles to stay afloat under a ridiculous workload. As the only female financial analyst at her firm, she knows her boss is doing everything in his power to replace her with another smooth-talking good ol’ boy. When his patronizing lectures about her substandard productivity get worse with each passing day, she knows it’s only a matter of time until she’s standing in the dreaded unemployment line. After a bad day of work (which is pretty much every day) she seeks comfort from her longtime boyfriend, Mark. But sadly, he’d rather play video games and go bowling with his douchebag friends than spend quality time with his girlfriend. For six long years, Helen has been trapped in a dead-end relationship with a man she doesn’t even love. Unwilling to own up to her true feelings, she convinces herself they’re meant to be together. They’ve stuck it out this long, so why rock the boat? On the cusp of turning 30, Helen still has no idea who she is and how to live her life on her own terms. Since she was a kid she always wanted to be a writer, but her dream fell flat when her father warned her of the uncertainty of writing jobs. Desperate for her father’s praise, she decided to pursue a stable, lucrative career in finance. Although she appears to be right on track, her life is spiraling out of control. Thankfully she has her best friend, Sophie, to turn to when times get tough. I absolutely adore this character, probably because she reminds me of my own BFF! Smart, sassy and honest (sometimes to a fault), Sophie offers comfort and comic relief when Helen needs it the most. Even though she’s rich, gorgeous and engaged to the perfect man, it’s impossible to hate her. OK, maybe I hate her just a tad for having the ability to eat whatever she wants without gaining weight! Unlike Helen’s own sister, who only cares about keeping up with the Jones’ in her posh Orange County neighborhood, Sophie is there to pick up the pieces when everything falls apart. They say blood is thicker than water, but I think that’s a bunch of crap. True best friends will have your back – no matter what. When her problems inevitably come to a head, Helen realizes her only chance at happiness is to finally call her own shots. And if that means going against her father’s wishes and putting her relationship with Mark out of its misery, so be it! Determined to pursue a writing career, she takes on a pro bono job at a local travel magazine and steadily builds upon her portfolio. Even though she’s not making any money, she loves writing. And for the first time in years, she’s on the verge of finding happiness. But yet there are still a few kinks she needs to work out, especially in the love department. When Mr. Perfect comes along, she makes a slew of self-sabotaging mistakes. I don’t want to give away any spoilers, so I’ll stop right here. You’ll just have to read the book to get to the good stuff. Trust me, it’s well worth your time. Overall, this is a fun and engaging character-driven read. This talented new author proves her understanding of women’s relationships with a style that’s both snappy and heartfelt. Women will absolutely recognize themselves and their friendships on the pages. Fans of Emily Griffin, Jennifer Weiner and Jane Green will enjoy this introspective, sharply realistic and tenderly humorous novel. Don’t get comfortable because you won’t be able to put it down! 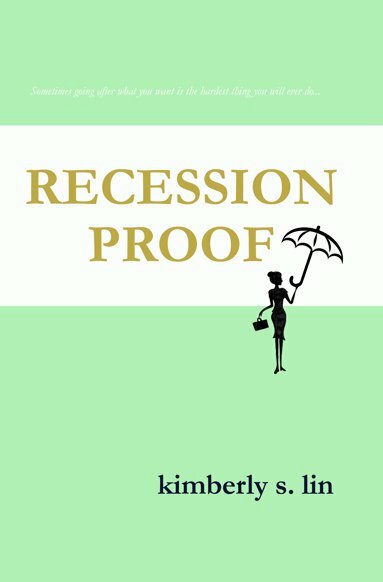 Posted on April 2, 2012 by Bubble Bubble Books and Trouble •	This entry was posted in Adult Fiction, Inspirational, Tear Jerkers and tagged Kimberly S. Lin, Recession Proof, women's fiction. Bookmark the permalink. This book sounds like an enjoyable read. Looked up the author–a fellow UCI grad with an econ degree. Sounds like she is writing what she knows. Thanks for bringing her forward. And yes….sadly…blood not thicker than a true best friend. Everybody is loving this book! I will grab it now! Thanks, Nancy for the Kindle tip! AH! Better late than never! But THANK YOU CHICK LIT CAFE! Much much much love.